Egypt releases air strike footage Jump to media player The Egyptian defence ministry has released video reportedly showing footage of air strikes on Islamic State (IS) targets in eastern Libya. Who are the Coptic Christians? Jump to media player BBC News has the essential facts about Egypt's minority Coptic Christians. Egypt condemns 'inhuman killers' Jump to media player Egypt's president condemns the ''inhuman criminal killers'' who purportedly beheaded 21 Egyptian Christians kidnapped by Islamic State militants in Libya. 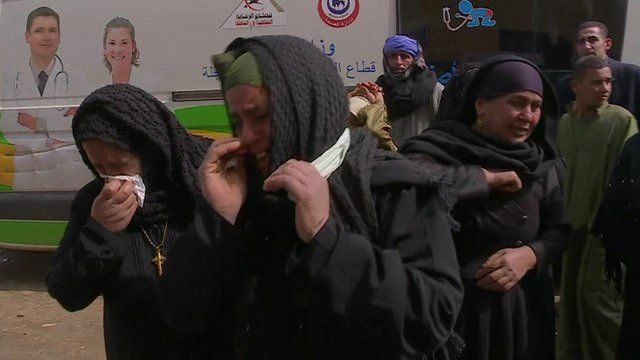 Egyptian planes have attacked so-called Islamic State (IS) targets in Libya as a response to the beheading of 21 Egyptian Coptic Christian hostages. F-16 jets took off to strike training camps and weapons stores at Derna, in a country where Islamist extremists are seen as a growing threat. Orla Guerin reports from the village Al-Our, in Minya, which was home to 13 of the 21 Christians murdered by IS.